This is a high performance antenna for use where coverage is essential. The multi-band design of the Strike B2 7dBi Heavy Duty Bull Mount Antenna sets this antenna apart from others.It has been especially designed to provide maximum range and performance. This antenna’s high gain and reliable performance over GSM 850/900/1800/1900/2100MHz frequencies makes it ideal for rural areas. This antenna has a removable whip and comes fitted with an FME connector and a bull bar mounting bracket which makes the installation quick and easy. The removable whip allows for seamless removal and re-attachment as the user desires. This antenna whip is black. Works with all Australian networks. This is a high performance antenna for use where coverage is essential. The multi-band design of the Strike B2 7dBi Heavy Duty Bull Mount Antenna sets this antenna apart from others. It has been especially designed to provide maximum range and performance. This antenna’s high gain and reliable performance over GSM 850/900/1800/1900/2100MHz frequencies makes it ideal for rural areas. 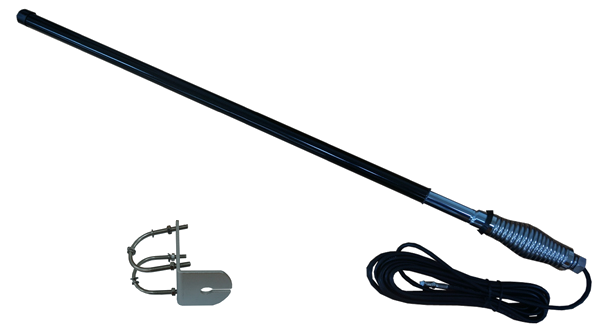 This antenna has a removable whip and comes fitted with an FME connector and a bull bar mounting bracket which makes the installation quick and easy. The removable whip allows for seamless removal and re-attachment as the user desires. This antenna whip is black. Works with all Australian networks.